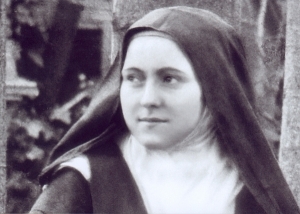 Saint Thérèse of the Child Jesus and the Holy Face - better known as Thérèse of Lisieux or 'The Little Flower' - was a Carmelite nun who died in France in 1897. She is one of the best-loved saints of modern times, whose profound wisdom was recognised in 1997 when she was declared a Doctor of the Church. Photograph of St. Thérèse in Lisieux Carmel. for the intentions and the glory of the Sacred Heart of Jesus. by uniting them to his infinite merits. by casting them into the furnace of his merciful love. so that one day we may be reunited in Heaven for all eternity. whom you behold face to face. who came to smile on you when you were suffering. I unite myself to them as my brothers and sisters. Show yourself to be our sister, and pour on us a shower of roses. and make us stronger in faith, hope and love on the road to life. as you learned from Jesus himself. that like you we may be love in the heart of the Church. and know the eternal joy of the children of God. Statue of Saint Thérèse at Faversham.